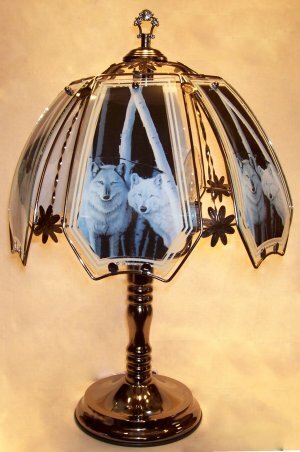 Two wolves, blue and gray are the main colors in this design.Glass and metal touch lamp with black chrome finish. 24” height. The two wolves peering at you will add a touch of the wild to your decor. These glass panels will always look great! The touch sensor gives you 3 light level settings with only a touch to any metal part of the lamp. The black chrome finish looks great with only minimal care. (Care instructions with lamp.) Changing your light level is as easy as 1-2-3. One touch on the metal gives you the lowest light level, a second touch gives you medium light and a third touch sets you lamp to its highest level of light. A final touch turns your lamp off. All of this is done with regular candelabra light bulbs, up to a maximum of 100 watts. This lamp uses 3-candelabra light bulbs and includes three 15-watt bulbs to get you started immediately. (Remember to replace with any candelabra bulb up to 25 watts each—3 times 25= 75 total watts. Any color, or shape, frosted or clear, pointy or round, candelabra bulb will work.) The touch sensor that makes all of this possible is covered by a one year warranty. Simply return the sensor to us for a replacement within one year. Touch sensors are also available for purchase.